Shop Insurance Canada Announces Merger with Kanetix Ltd.
(PRLEAP.COM) Online insurance broker, Shop Insurance Canada (ShopInsuranceCanada.ca) has announced it has merged with online comparison site Kanetix Ltd. (Kanetix.ca). The move is part of Ontario Teacher's Pension Plan (OTTP) agreeing to acquire Kanetix for an undisclosed amount. Announced over the weekend, the acquisition will see the OTTP take control of Kanetix. As part of the transaction, RDA Insurance CEO Igal Mayer will become the new CEO of Kanetix. Mayer replaces former president and CEO Andrew Lo, who stepped down on Aug. 31 when the deal was announced. With decades of experience in the industry, Mayer is the founder of Shop Insurance Canada and a former CEO of Aviva Canada, Aviva UK, and Aviva Europe. Shop Insurance Canada has now been moved from RDA Insurance's stewardship to Kanetix, where the company says it will be able to expand scale and reach more customers. Founded in 2015, Shop Insurance Canada has become an innovator in digital brokering, including the development of a leading online quote tool. Mayer will remain Co-Chairman of RDA Insurance and will remain CEO of Shop Insurance Canada through his leadership role at Kanetix. By moving Shop Insurance Canada under Kanetix' wing, RDA Insurance says it can "focus on building our core business and continuing to deliver excellence as an industry leader in face-to-face insurance brokering across commercial lines, surety, personal lines, group insurance, and financial services." Kanetix is notable as Canada's first ever online insurance service and has become the largest independent quote comparison site in the country. Launched in October 1999, Kanetix.ca provides over 8 million quotes to consumers each year. 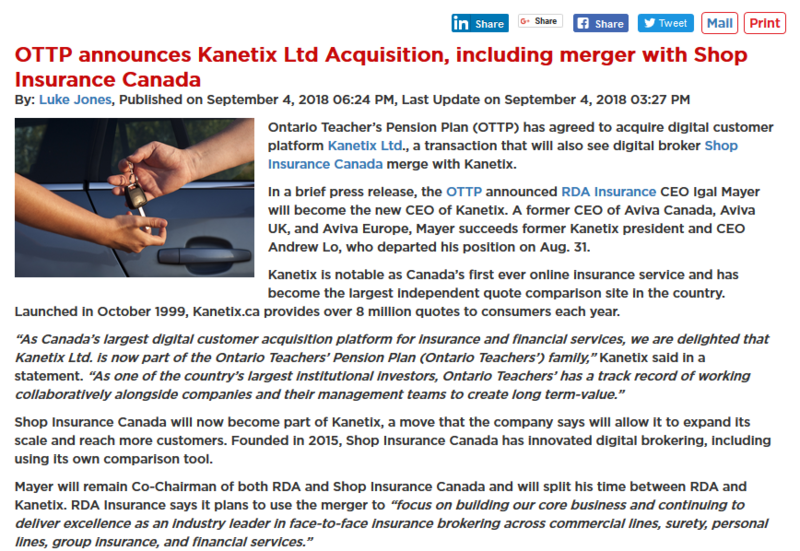 "As Canada's largest digital customer acquisition platform for insurance and financial services, we are delighted that Kanetix Ltd. is now part of the Ontario Teachers' Pension Plan (Ontario Teachers') family," Kanetix said in a statement. "As one of the country's largest institutional investors, Ontario Teachers' has a track record of working collaboratively alongside companies and their management teams to create long term-value." Shop Insurance Canada works hard to bring all the latest insurance news to customers. We believe that understanding the industry starts with knowing what is happening day to day. Our customers and readers are hugely important to us, and we want them to get the best deals by being involved in the industry. If you have any interesting insurance topics or stories, let us know and we will be happy to consider it and write it up.